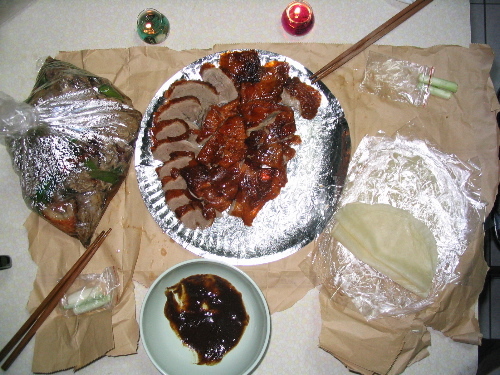 北京烤鴨 (bei3 jing1 kao3 ya1) Peking Duck. This is a serious bargain. Just look for the ducks hanging from their hooks in front of a stall, or for some cute rendering of a duck on a sign over the street. For NT$250 (US$7), you get a a whole duck--the plate of boneless duck meat, the rolling crepes, scallions, sauce, and that big bag that holds the rest of the yummy yummy smoked duck. Enough for a family of 4, and DELICIOUS! They are smoked right there on the street, so just follow your nose.